And so the season is upon us, and the discerning travelers are preparing for Christmas – at home? Yes, at home for the first time in many years. Most people would think that wasn’t so odd – they spend the festive season out-of-town with relatives every year. We, however, usually spend it in a hotel. And what’s more, we like it that way! 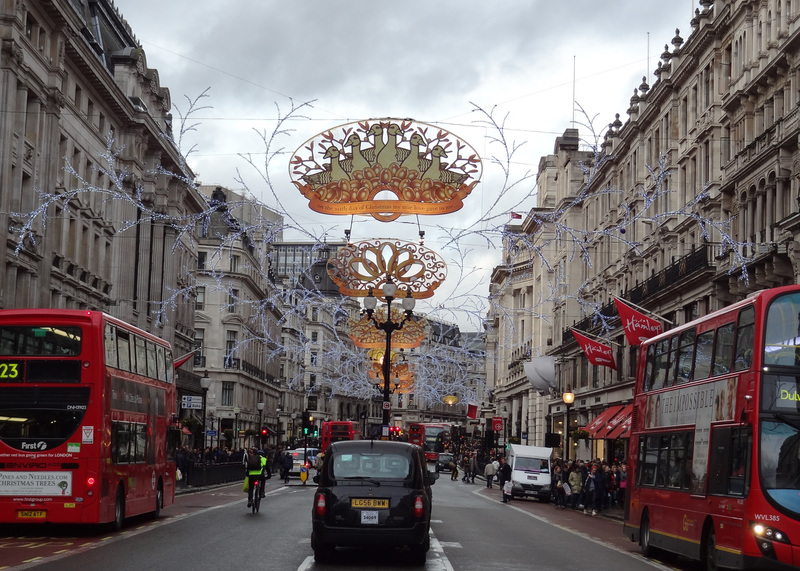 London is dressed for the holidays and for our Christmas last year. This time last year, we offered you Travel for Christmas? You bet! where we explained how this seemingly odd situation came to be, and gave you a few tips for spending the holiday season far away from home. Two years ago, we shared our story A Merry Christmas Cruise, the most memorable Christmas experience we ever had as a family. But last year’s Christmas season was so memorable, we have to share a bit of the story with you. Early in 2013 our son, the twenty-something performing artist decided to leave his long-term contract with Les Ballets de Monte Carlo to return to his original roots: musical theater. An accomplished dancer and singer, he decided to start at the top: he would move to London and audition for the West End. So he did, and so he debuted in the West End at the Savoy Theatre in the revival of Cabaret in the fall of last year. So, where would the discerning travelers spend Christmas? In jolly old London, of course. We checked into the Marriott Park Lane just before Christmas to find ourselves surrounded by crowds of people all celebrating the season. Children were having their photos taken in front of the glittering Christmas tree in the lobby; parents were enjoying a festive cocktail in front of the roaring fireplace. All this seems so normal – but most of these people were from the Middle East, and few of them were even Christians. As we have always said, the Spirit of Santa Claus transcends any religious affiliation at this time of year! They were having fun. 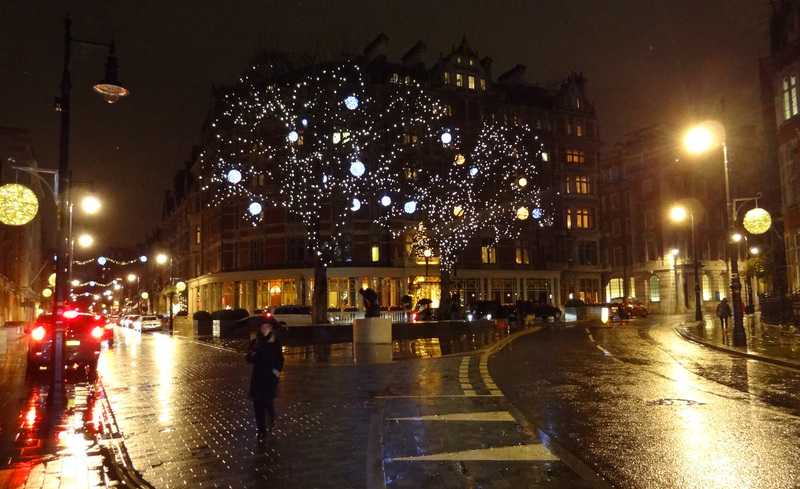 Who could mind a rainy Christmas evening if you can spend it in London? And so were we. Two days before Christmas we treated ourselves to an afternoon of the English National Ballet’s Nutcracker. As anyone who knows us, or reads us regularly will know, The Nutcracker has been the cornerstone of many a Christmas season – just ask anyone with a child who is a ballet dancer. We had seen son Ian in many performances of the National Ballet of Canada’s Nutcracker from the time he was 11 years old until his second year with the company at the age of 20. The English National Ballet’s was lovely – wonderful dancing, the beautiful Tchaikovsky score and the traditional story. Even at that, though, it had little on the NBoC’s spectacle that has something for everyone – even those who (horror) do not appreciate ballet as a form of entertainment. But we had a memorable afternoon, imbibing champagne at the interval and enjoying a traditional holiday treat. On Christmas Eve we made our way up the street to the Marriott Grosvenor House to eat (one thing we know to be true: you can always find an open restaurant on Christmas Eve or Christmas Day at a lovely hotel!). 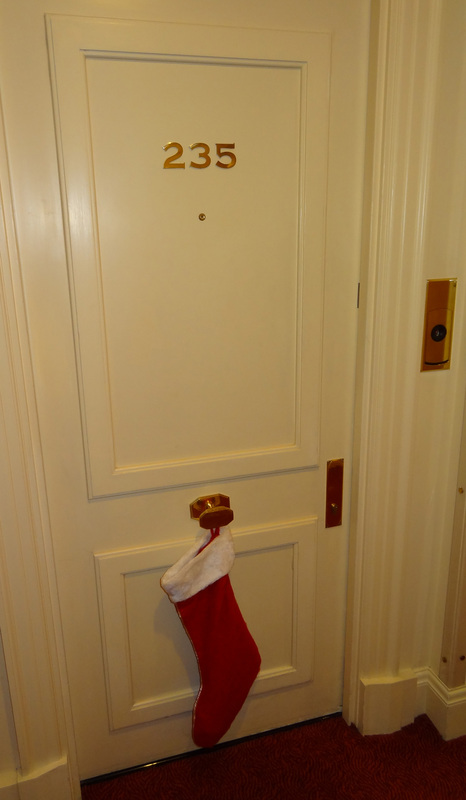 Upon our return to our own hotel room after a wonderful meal, we found that Santa had left a stocking filled with chocolates on our door knob (thanks, Marriott elves!). Marriott elves helped Santa Claus last year! The next morning found London at its best – empty. What a treat to take a walk along the storied streets with hardly a living soul about. We didn’t mind the rain at all. Later we repaired to the dining room for some live entertainment and a stupendous Christmas meal that included turkey with all the regular trimmings and a few surprises. Having someone else madly shop for groceries, plan the day to the letter, sweat over a hot oven, serve up meals for everyone may not be everyone’s cup of tea – but it is ours. That said, we are looking forward to Christmas here on the bay this year. Then a mere four weeks until we head to the South Pacific. We wish a wonderful holiday season to all our regular readers– and those who happen by.